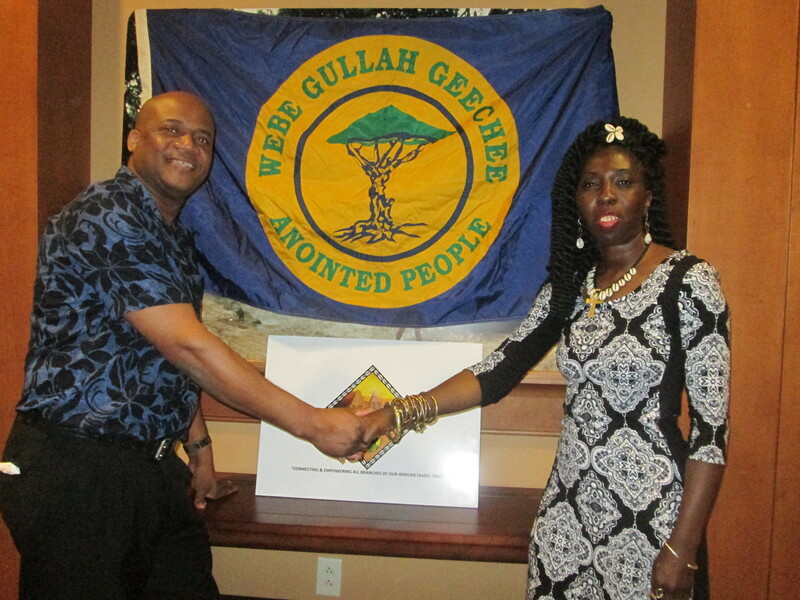 Gullah/Geechee Land Redeemed by Pan African Family Empowerment & Land Preservation Network! 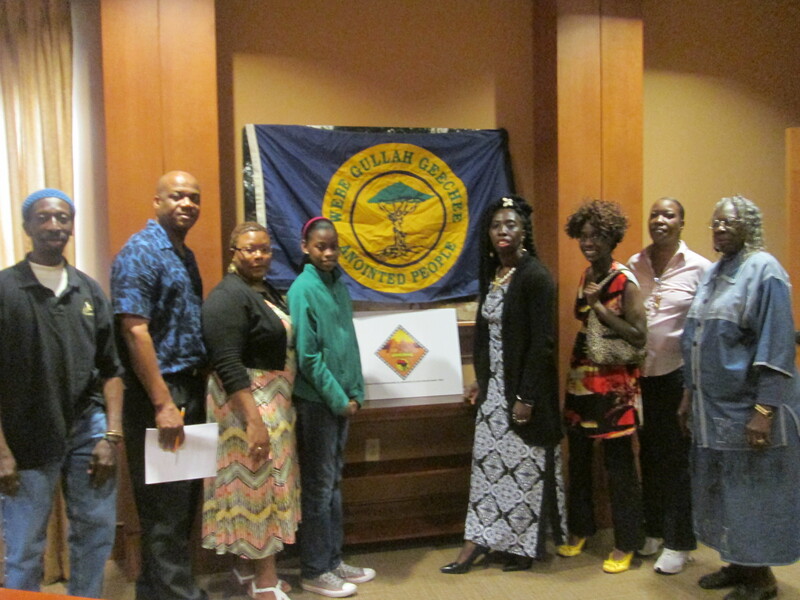 NON-PROFIT Pan-African Family Empowerment and Land Preservation Network (PAFEN) REDEEMED FIRST PROPERTY OF GULLAH/GEECHEE FAMILY SOLD AT 2014 BEAUFORT COUNTY DELINQUENT TAX SALE MAY 15, 2015. 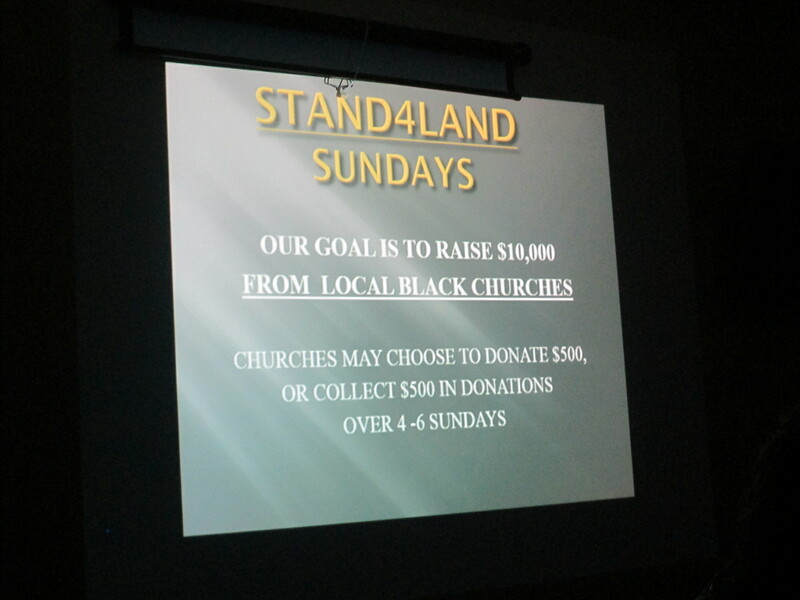 When Charima Allen went to church at St. Helena Island’s True Vine Temple of Praise on April 19–she had no idea that her family’s prayers for help redeeming their land sold at the 2014 Beaufort County Delinquent Tax Sale would be answered before church ended. But they were. The answer came in the form of guest speaker Theresa White’s presentation about the non-profit Pan-African Family Empowerment & Land Preservation Network, and its special STAND4LAND SUNDAYS donations from local churches to help Gullah/Geechee families redeem property sold at tax auctions, and to pay their property taxes to prevent it from being sold. As a result of White’s visit to her church at the invitation of its Pastor Kitty K. Green, on Friday, May 15 at 4 p.m., Allen’s family’s 1.57-acres of land will become the first Gullah/Geechee family-owned property redeemed by the Beaufort, SC-based Pan-African Family Empowerment Network. “I feel like God sent an angel to help us,” Allen says of the PAFEN, which will pay the Beaufort County Treasurer’s Office $941.54 to redeem the St. Helena Island land that her late father, John H. Wright, Sr., purchased for his family seven years before his death in 1999. Allen and her sister Claressa Wright, have been paying the taxes on the family’s land since their mother, Clydesther, passed away in 2000. But in 2013, with Allen, the mother of four, unemployed, and Wright trying to raise three children on a tight budget, the hardworking sisters were unable to pay the taxes for the first time. And, unfortunately, their other family members, weren’t able to offer any help. On March 17, Beaufort County added their unpaid 2014 property taxes to the redemption cost–and the amount due skyrocketed from $504.27 to $941.54! But the sisters continued to believe that God would make a way. “I glad that we’re able to help them both redeem their property, and learn how to make the transition to becoming a part of the Installment Payment Program offered here in Beaufort County,” said White, a former journalist and congressional aide, who founded the PAFEN in 2013. She wears several hats in the organization, including President & CEO. The PAFEN is also trying to help Beaufort resident Michelle Lewis save her lifelong home on Congress St. Lewis currently owes $5,598.11 in redemption costs. But that figure will increase twice more in July: On July 1, Beaufort County will automatically add a $225 Title Search Fee to all unredeemed properties. Then, on July 9, the quarterly interest due to the winning bidders will be tacked on, according to Ashley Young, a Tax Agent with the Treasurer’s Office. “I’ve lived here all my life–and I don’t want to be homeless,” declares an emotional Lewis, 49, who’s lived in the Congress St. home since she was adopted by the late Richard and Sarah Stanfield when she was just two-weeks-old. She now shares the residence with a grandson, 16. The former home healthcare worker is currently unable to work due to a recent knee surgery. White says that the PAFEN will work with both families to get their property redeemed, and signed up for the affordable Installment Payment Program, which breaks property taxes up into five equal advance payments on the next year’s tax bills. “It’s a guaranteed way never to get behind on your taxes again–as long as the payments are made on schedule,” she observes. But White also points out that application forms for the Installment Payment Program weren’t included with the 2014 property tax bills. 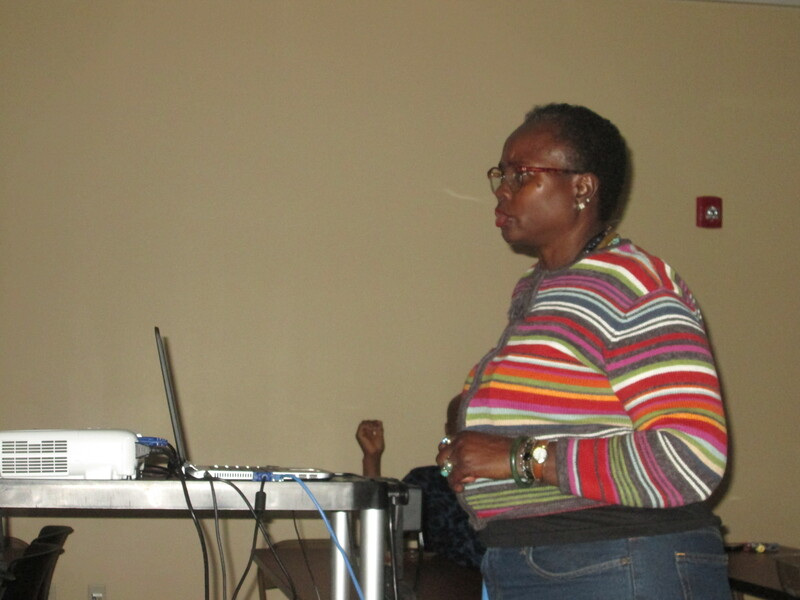 And many Gullah/Geechee families haven’t be able to take advantage of the program–a problem she and other PAFEN Advisory Board Members are working to correct with form distributions and upcoming classes. 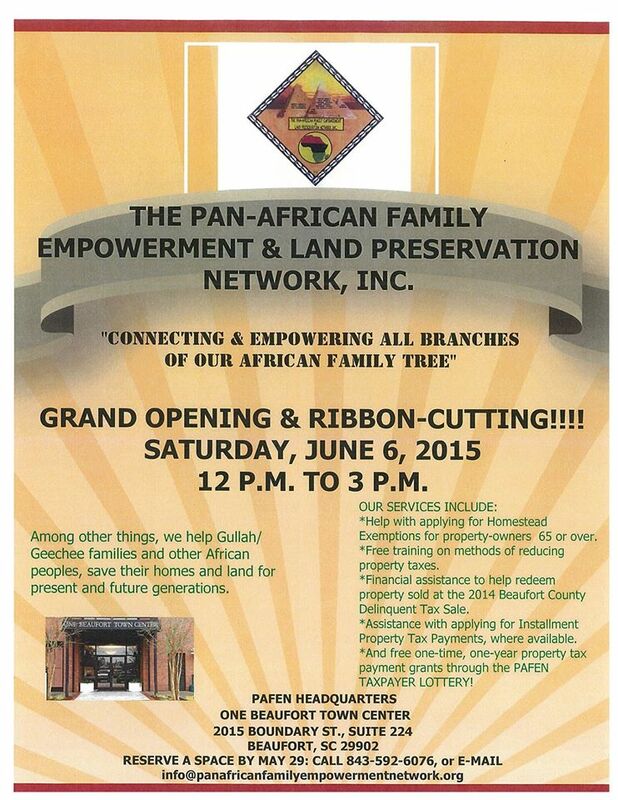 More information about strategies to help save Gullah/Geechee land will be provided during PAFEN‘s official Grand Opening & Ribbon Cutting which will be held on Saturday, June 6, from Noon to 3 pm at One Beaufort Town Center 2015 Boundary St. in Beaufort, SC in the Gullah/Geechee Nation. Allen, Wright and Lewis don’t have to worry about paying the PAFEN back for redeeming their property. They’re all receiving a one-time grant from funds being raised by the PAFEN‘s $5-million “Help Save Gullah/Geechee Land” Campaign, most of which has been generated by a Certified Charity Campaign on GoFundMe.com. The link for that campaign is http://gofundme.com/panafricanfamilyem. Checks can be mailed to: PAFEN, P. O. Box 706, St. Helena Island, SC 29920. More than 30 people have donated to the success of the campaign since it was launched by White on March 5, 2015. Among them are award-winning photojournalist Pete Marovich whose photos are being used on the GoFundMe.com poster and the PAFEN website; and PAFEN Advisory Board International Vice Co-chairs Somali Prince Dr. Mohamed H. Mukhtar and Queen Quet, Chieftess of the Gullah/Geechee Nation; and our First Vice Chair Stephen McHayle of Jamaica. PAFEN International Co-Chair of the Advisory Board Queen Quet, Chieftess of the Gullah/Geechee Nation; and First Vice Chair Stephen McHayle of Jamaica at the PAFEN office united to save land for the African family. More volunteers are needed to help the PAFEN assist as many families as their funds, and educational resources will allow. For more info, contact the PAFEN at 843-815-3558 or 592-6076.